This 2" Nettles Flatbottom is a comfortable fit, no matter if you perform, ranch or trail ride. It is that comfort that has made it the #1 seller in the Premier line. 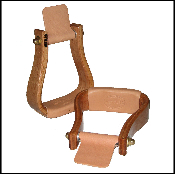 As with all Premier stirrups, the 6 pieces of laminated oak give it extra strength while the use of the highest quality leather for pin covers and treads guarantees you'll have plenty of rides in the saddle before these stirrups need re-treading! Six layers of high quality red oak, varnished finish, brass fittings, highest quality leather. 5.5" bolt to tread, 5.25" inside width, 3" bolt width, 2" treadwidth. Price is per pair.